We had a very hot summer here in New York, Patrick and I historically haven’t used our central sir conditioning very much, some years we just tough out the heat, and others we install a window unit or two and blow around cool air on particularly warm days. 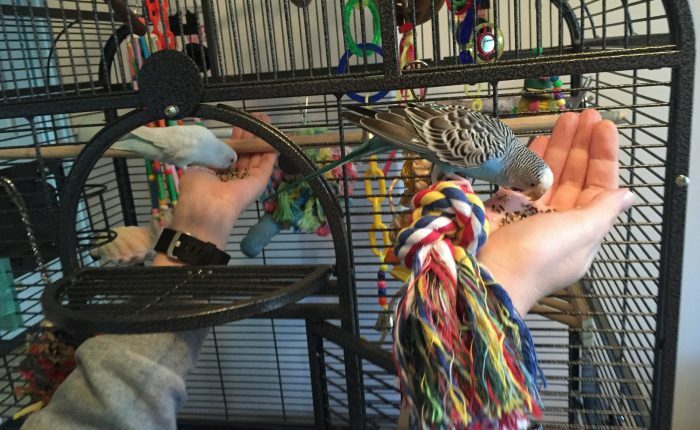 Life with budgies definitely changed that habit! Like a lot of animals, parakeets don’t have sweat glands, and when they overheat they don’t have too many ways to cool themselves down. Mostly, you’ll see them hold their wings out from their bodies to get some air flow going, which is something they also do when they are feeling very aggressive. Am I mad? No, just hot! This summer, we found that we needed to use the central AC most days, but we kept it at 78 degrees, which was relatively comfortable for all parties, without breaking the bank on energy usage. If you’re using window units or fans around your parakeets, please don’t have direct cold airflow on the parakeets. That goes for central AC vents as well. Additionally, if you have ceiling fans any fan without blade guards you will not want to use those when your budgies are out and about, as they can get seriously injured or killed being struck by a fan. Budgies do best in temperatures that range from 65-85, but the key is about keeping the temperature relatively steady. A rapid 20 degree swing in either direction would be hard for them to cope with, but over a period of days/weeks they will adjust to increasing or decreasing temps. As I write this it’s towards the end of September and looking at the weather forecast I’m expecting to turn on my heat towards the beginning of next week, usually we humans would tough out the first cold overnight dips, but the parakeets are not going to be comfortable at 64 degrees or lower; last winter we kept the house at a steady 68, which Toby seemed happy with. 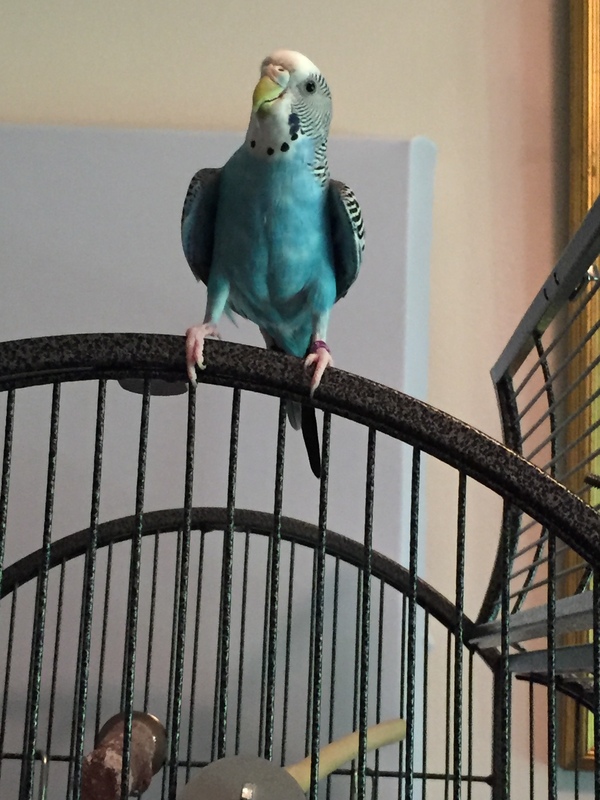 So – an overheated budgie holds his wings out from his body to get some air flow to his “armpits”, what does a chilly budgie do? 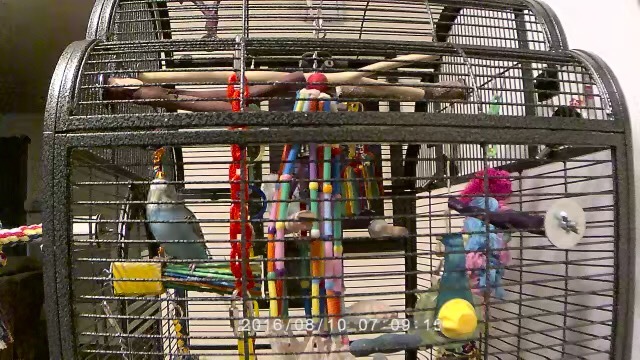 He fluffs all his feathers out to trap more heat between them, which looks a lot like preening behavior or sick budgie behavior. We only saw Toby do this a couple of times last winter, on days that were exceptionally frigid. A parakeet is a warm weather bird that can acclimate reasonably well to a range of temperatures, but in addition to keeping them warm enough in winter you should also keep an eye on the humidity, they are happiest in 60-70% humidity, which certainly feels too damp for us. We shoot for 50% and keep track of it with an AcuRite 00613 Indoor Humidity Monitor . 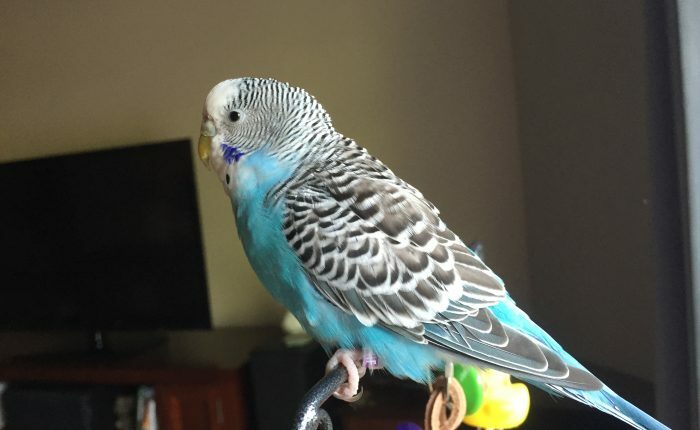 Budgies without enough humidity can get dry, cracked feet, among other things, so you can also make sure your budgie is getting a bath in winter, or at least getting his feet wet to help with scaliness. Another way to help your budgie regulate his temperature in winter is with a K&H Sand Thermo-Perch Heated Bird Perch – Small 10.5″ . 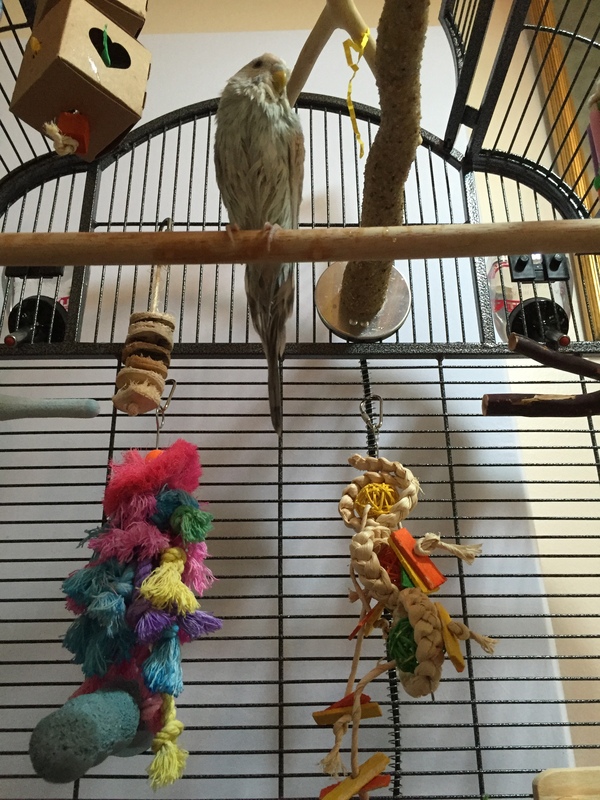 The recommendation is to put it in the top 2/3 of the cage, so hopefully your parakeet will choose to sleep on it overnight and keep warm in dropping temps. We tried using this last year and Toby wanted nothing to do with it – avoided it like the plague. This year I thought perhaps Kelly would like it and show Toby there was no imminent danger, so I installed it directly below the most coveted sleeping perch. They were fine with its existence all day; although no one wanted to touch it, but come lights out Toby would not settle down and basically acted like she couldn’t get to her sleeping perch because this hideous heated monster was in her way. We have a hard and fast rule now about not putting our hands in the cage after “bed time”, so all I could do was unplug the vile thing and hope that was the issue. Toby did settle down shortly after, although I’m not sure whether I can truly draw a correlation or whether she was just exhausted. Either way, I took it out the next morning. We may end up using it like we did last year, when we installed it very low in the cage and just hoped that some of the small amount of heat radiating out would help. There are tons of great reviews of these; I think it’s a useful and safe product, Toby is just to fearful for it to work out as intended. It comes in two textures, I purchased the sand-like option, which I would also recommend, I read several reviews of parrots not being able to get a grip on the smooth version. When it actually gets cold I’m going to buy and try the K&H Manufacturing Snuggle Up Bird Warmer, Small/Medium Grey – I am sure that since it’s gray Toby will want nothing to do with it, but at least I could put it somewhere that’s not near sleep town and maybe Kelly will enjoy it, or Toby will accidentally end up near it once in a while. I’ll report back after we’ve given tried it out. Bottom line on parakeet temperatures is to watch out for rapid swings in either directions and you should be okay. I’ve seen parronts reporting that they keep their homes in the low 60’s in winter and their budgies adjust, and I’m sure that not everyone has central air conditioning in summer, or even necessarily window AC units. Keep in mind that if you’re uncomfortable with the temperature they probably are too, and you should be good to go. Well, I made it through vacationing away from the parakeets, and it wasn’t nearly as traumatic as I expected. We were on a cruise and my original expectation was that on port days I would have cellular service, which turned out to be completely untrue. I ended up purchasing a package of wifi minutes on the ship, but I was never able to send/receive text messages or make calls. I emailed my mom as soon as I could to let her know, but everything was going perfectly well at home anyhow. 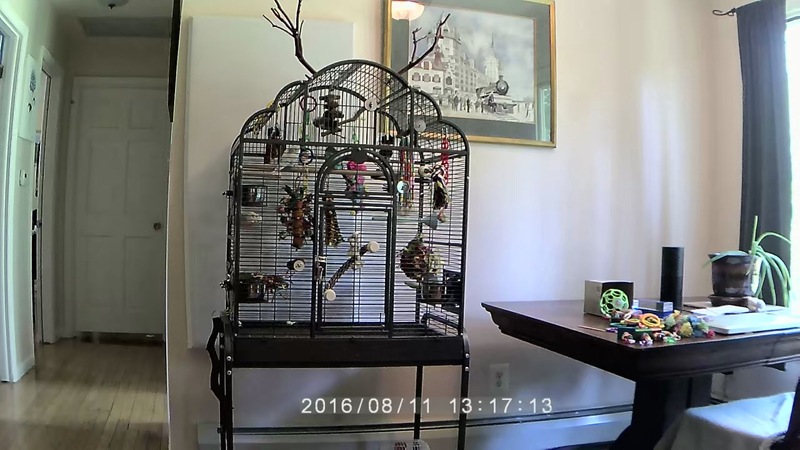 She spent at least an hour there every day so the parakeets got some time out of the cage, and I know that she worked with Kelly on stepping up and not biting, which we have been struggling with. I was worried about losing ground with her while we were gone, but instead I think my mom made real progress. What, me a biter? I’m far too sweet! As expected, the only one with any trouble was me, which was why we bought the MiSafes Mini 1080p HD Wireless Day & Night Wi-Fi Camera for iPhone iPad Android (Black) before leaving. With Amazon Prime’s two day shipping I was able to purchase it during a freak out just a handful of days before the cruise. Set up was a breeze, you plop the camera where you want it – it even includes a couple of mounting options, then download the misafescam app and pair the device to your phone. The picture is good, even in its normal quality mode, and you can switch to HD. The camera is in a fixed position which was perfect for our needs; we set it up to get a full view of the cage and were good to go. You could also insert an SD card and record, which I haven’t done since I’m only using it to peek in at them. I love that there is a two-way speaker option so I can hear the birds singing away, we tested the ability to talk to them through the app and it worked, but I haven’t used it, thinking that could be pretty confusing for them. 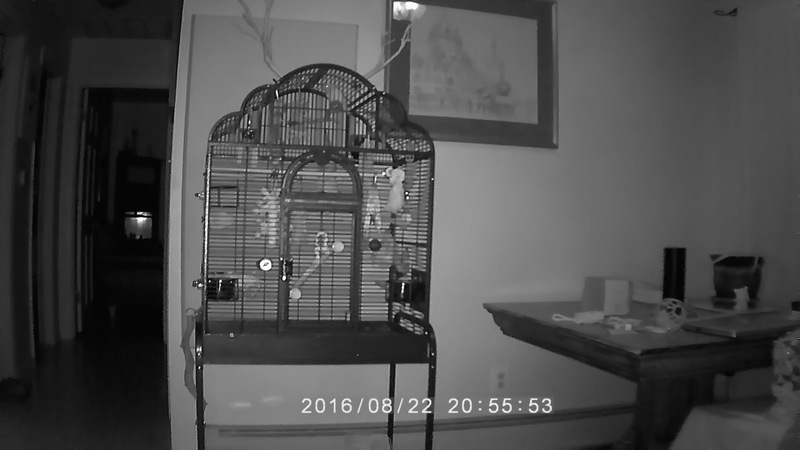 The night vision works very well too, although it’s a little creepy when they have their eyes open in the dark, you can see pinpoints of light. demon eyes in the dark! The camera was comforting, although I didn’t use it as much as I planned due to the cellular issues. The ship’s wifi was not speedy and I wasn’t able to get the camera to connect every time. I also wound myself up the first night, we were staying in Miami and I had horrible cell service in out hotel room and no wifi. I checked on the parakeets at about 7:30pm and expected them to be bedded down for the night, instead they were still engaged in their nightly bouncing around before bed/fight for perch dominance routine. I promptly lost service after that and wasn’t able to check on them until hours later, imagining all sorts of horrible scenarios of it getting to dark and them being stuck on perches they didn’t like, or having night terrors and me not being there to help them. When I finally got it to connect again they were absolutely fine, sleeping exactly where they usually do. So – outside of external issues the camera has been fantastic. Even now that we are home I like to take a look at what they are up to during the day. If I ever felt like I didn’t need to look at them we could easily use this as a security camera, there’s an option to have it alert you if there’s movement in its field of vision, so I could see pointing it at the door and setting up that notification. When we got back from the trip the ‘keets had a relatively brief period of readjustment where they seemed to be out of sorts and looking for my mom. Toby in particular kept flock calling when we were all in the same room. This has mostly worn off although I think Toby is still feeling a little mad at me it’s getting better every day. At any rate, based on the level of anxiety I was feeling before we left I was pretty ready to write off taking week-long trips for a while. now that we are back I can see that a lot of my stress was unwarranted, the birds were totally fine, and I was as well! For a long time, I’ve been wearing a gold cast of a hummingbird skull that I bought from an Etsy seller Blue Bayer Designs NYC. 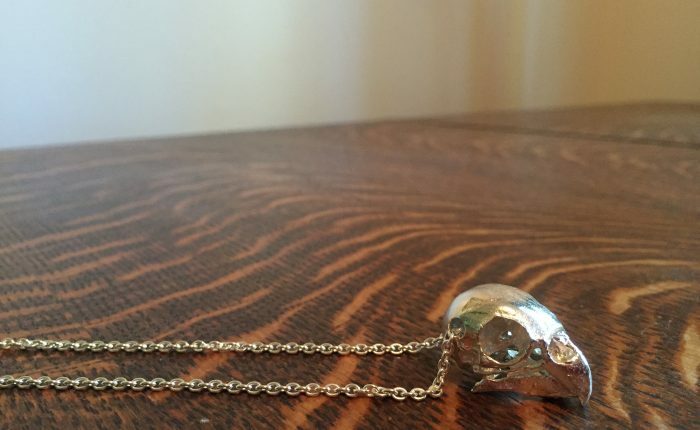 I love the look of this necklace, unless you’re right up on top of it you can’t tell at all that it’s a skull, it has a unique shape and looks great with anything. As I was getting ready for our upcoming vacation I started thinking that I’d like to wear something every day to remind me of the parakeets, since I’m struggling with leaving them behind. I started searching on Etsy and found a couple of cute options, and then found this seller, Skeletos, located in Germany, who also makes casts of bird skulls and turns them into jewelry. I saw that he had a parakeet skull necklace and knew I had to have it! The listing says it’s a life-size parakeet skull but it seems big to me. I think it might be an Indian Ringneck or some other type of larger parakeet and not the smaller American Parakeet. Regardless, it’s beautifully detailed and has the same structure as my parakeet’s heads and the large size gives it a nice presence, it’s definitely more of a statement piece than the hummingbird, but it will certainly remind me of my ‘keets while I’m away. The pendant is on the heavy side but very comfortable to wear, the way it’s suspended from the chain makes it well-balanced and I really don’t feel that I’m wearing a necklace at all. Both the pendant and chain are excellent quality, beautiful and highly polished. The jaw of the skull is even articulated and opens/closes very smoothly. The necklace shipped out quickly and the packaging was awesome, including a cute little box and a hand-written note from the seller. If you’re looking for something outside of the norm to celebrate your love of birds I absolutely recommend Skeletos, both for the quality or their product and great customer service. Note – I ended to take some cool pictures of the parakeets with the necklace but Toby was freaked out by it, which furthers proves how realistic the form is!